The southern part of Chile and Argentina is vast, and there are many places to visit. 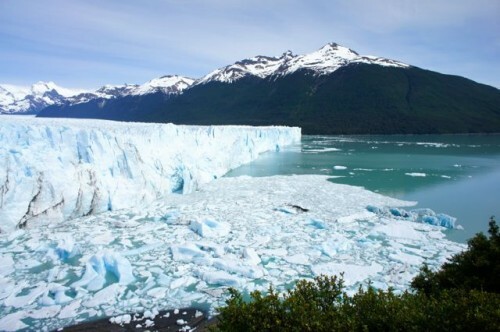 For a short itinerary we recommend visiting El Calafate for the incredible Perito Moreno glacier nearby; El Chaltén, the hiking capital of Argentina, two hours drive away overlooking Mt. Fitzroy, and Torres Del Paine national park in Chile. It is easy to rent a car in El Calafate or in Punta Arenas in Chile and cover all locations in a week or more, depending on the amount of hiking one is interested in. 1) Perito Moreno glacier is an awesome sight: a wall of ice ending by a lake with pieces of ice constantly falling into the water. The glacier can viewed from special balconies built nearby or from boats. No matter where to you view the glacier, you can hear the sounds of giant pieces of ice breaking off and falling into the water. Make sure you wear a thick jacket, plus a hat and gloves if you get cold easily, if you choose to see the glacier up close by boat. It feels as if you are in a freezer. 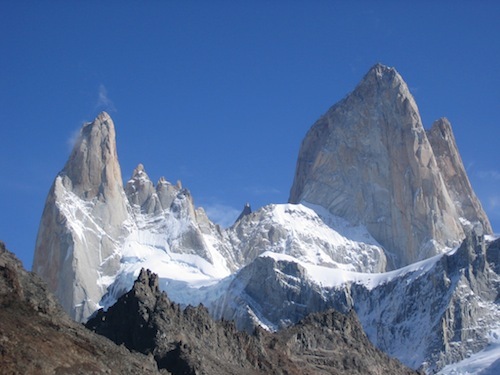 2) Hiking at El Chaltén towards Cerro Fitzroy. Even if your time is limited, you can drive there for the day, hike a few hours and return to El Calafate. If the weather is good, it is recommended to dedicate several days to hiking in this Alpine-style town. 3) Relax, shop and eat in El Calafate. The town has many bars, cafes, and excellent leather goods to purchase. From Buenos Aires fly Aerolíneas Argentinas or LAN Argentina. If you are in Santiago it is best to fly LAN Chile or Sky to Punta Arenas, rent a car and combine with a visit to Torres del Paine. Winters are cold and dark, so go during their summer months. December to February is the best period when the sun shines and the air can be warm. Accommodations in El Calafate are top notch. I found that staying closer to town gives more access to El Calafate stores, restaurants and nightlife. Sleeping close to the Glacier or in a ranch guarantees a peaceful time away from tourists. 1) Design Suites Calafate (where we stayed) is a modern boutique hotel 10 minutes drive from the center with panoramic views of the lake. It is quiet, private, contemporary designed with free Wi-Fi, large rooms and bathrooms, outdoor terrace, excellent breakfast, restaurant and bar (in the evenings), terrific spa with Finnish sauna, steam room, indoor heated swimming pool; excellent service (staff gave very useful advice on where to hike, where to eat in town). 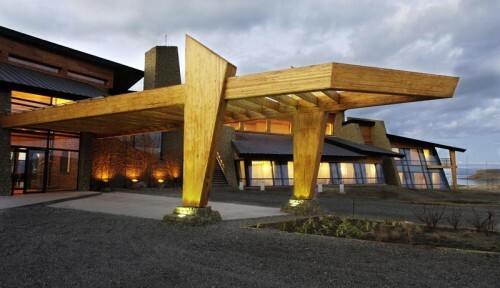 2) Los Sauces is a luxury ranch-style hotel with 42 rooms and 6 “casas” on a large estate close to the center of Calafate. Owned by the family of Argentinian president, Cristina Fernandez de Kirchner, this opulent hotel features cozy interiors with lovely views, large suites and small houses (for families), a spa, and two excellent restaurants. 3) Eolo is 30 minutes out of town towards Perito Moreno Glacier. It is the ultimate in luxury and price in the region. 4) Los Cerros hotel in El Chaltén, is a new hotel and a good base for those planning to spend several days hiking in the region. We find that while Argentinian meat is famous worldwide, it is actually no better than a good Kansas City American steak. For those who are looking for lighter, more savoury food, try the Italian food in Argentina. There are numerous excellent Italian restaurants in El Calafate, and as many Argentinians originated from Italy, the food is authentic and the pasta fresh and delicious. The gelato is outstanding. El Calafate has a long main street around which most of the shops, cafes, restaurants and bars are clustered. It is lively during the day and at night.